Do you want to be a firefighter or a... Monkey King? 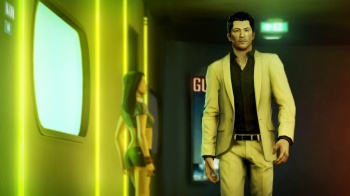 Square Enix hopes that you're once again ready to return to the gritty streets of Hong Kong, and this time you get to choose just what new Sleeping Dogs content you'd like to find there. The company is poised to introduce one of two new DLC packs, and it's using a poll on its official Facebook page to determine which one fans want more. The first option is called the Sun Wukong, or "Monkey King" Pack. The add-on will feature a new character skin inspired by ancient Chinese mythology, an unbreakable staff melee weapon, a hand-to-hand combat damage buff, and a new monkey-themed vehicle. The alternative is the Hong Kong Fire Fighter Pack. As you might imagine, this expansion will outfit you with firefighting gear including a full suit, fire axe, and even a fire department van for you to use. As of the time of this writing, the Monkey King Pack has over 650 votes, while the Fire Fighter Pack has just 130. If I had to guess, I'd say the promise of a monkey-themed vehicle is probably helping to tip the scales. The poll will close on October 21st, though there's no official word on when the winning pack will make its DLC debut.